This is a quick sketch for a small painting. There's a story behind this image, but when I'm in painting mode I don't want to write and vice versa. So, while I've got some momentum going I think I'd better take advantage of it and get this sketch transferred to paper so I can get out those juicy watercolors again. Such fun! Blueberry honey!!! YUMMMM!! 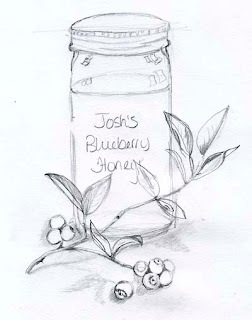 I often made blueberry jam .. or dry them for my cereal .... Super job on this!!! Can't wait to see the painting! Started on the painting yesterday and already I'm fighting my tendency to "paint and repaint". Keep things fresh, Teresa. Keep things fresh, Teresa. I need to drill that in!